National Training Center and Fort Irwin Commander Maj. Gen. Ted Martin (second, from left) and Command Sgt. Maj. Stephen Travers attach a “Go First Class” dental streamer to the guidon of United States Army Dental Clinic Command during a ceremony here, Feb. 24. Sgt. 1st Class Terry Scott, senior dental non-commissioned officer with Dental Clinic Command, holds the guidon and his unit commander, Col. Todd Kimura, stands to his side. The commanding team of this installation presented a streamer to a unit for increasing the dental wellness of Soldiers here, Feb. 24. National Training Center and Fort Irwin Commander Maj. Gen. Ted Martin and Command Sgt. 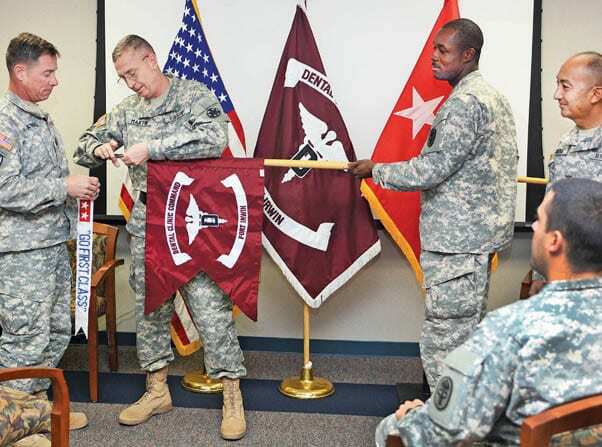 Maj. Stephen Travers attached a “Go First Class” dental streamer to the guidon of United States Army Dental Clinic Command during a ceremony here. Dental Clinic Command improved the dental wellness of Fort Irwin Soldiers to 66.63 percent, said Col. Todd Kimura, commander of the dental unit. This was in large part to the implementation of the “Go First Class” program where Soldiers receive a cleaning and annual exam all in one appointment. They may also receive a filling at the same time, if needed. The U.S. Army Dental Command has set a standard of 65 percent. “The significance of dental wellness in the Army is that it is a measurement of a Soldier’s dental fitness and resiliency,” Kimura stated. “Granted, some Soldiers have chronic long term treatment plans such as implant bone healing or orthodontics, but if a Soldier is Dental Readiness Category 1, or Class I, this means that the Soldier has no need for any dental work. “It’s been phenomenal and we reached it,” Martin said. Kimura stated the recognition to his unit demonstrates the cumulative and collaborative efforts of the NTC command teams, leaders, Soldiers, doctors and teammates of Dental Clinic Command.